OVLG was launched on May 12, 2007. It has been protecting legal rights and nourishing financial health of US people since then. It’s huge experience helps to solve complicated problems easily and serve clients better. Want to know how much did we save for our clients? Well, we have more than 150+ success stories wherein you can find out how much our clients saved in the last 8 years. You can check out the client details in your own eyes and decide about us. We have 360+ live client testimonials for you. We don’t have any written testimonials. But, what we have is even more powerful than written testimonials. You can watch 360 clients speak about their experience of working with OVLG and then believe why we are the best of the lot. OVLG is registered with the State Bar of California. It follows all the state rules and regulations. You can work with us even when your eyes are closed. OVLG is a member of California Chamber of Commerce since 2013. So, you can surely trust us now. Not satisfied with our services? Don't worry! We will give you a refund since our motto is clients come first. If you're not satisfied, then send an email to complaints [at] oakviewlaw.com. We would take steps to resolve the issues. OVLG is a blessing during hard times. It's truly a lifeboat in stormy seas. This is what our clients have said in Trustlink. Other clients have given 5 star rating when they were asked to review us. Need any free financial advice? Our counselors are ready to help you 24*7. All you need to do is leave a message in the Chat live option. You can also reach our counselors at (800) 530-OVLG. 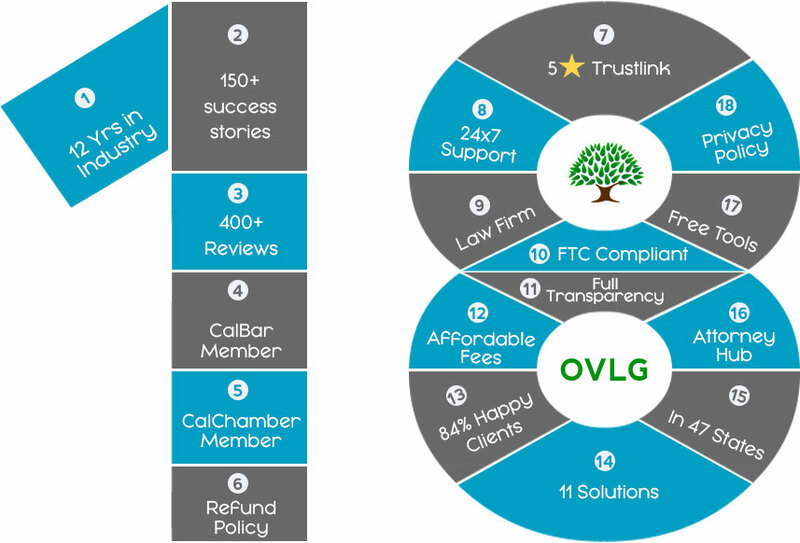 OVLG is one of the best law firms in the country. It has dynamic and energetic attorneys to provide best legal help to clients. As per the federal laws, any firm offering debt relief services should explain the cost and tenure of the programs. So before you enroll into any program, we give you an idea about how much you’ve to pay and can potentially save. Besides, you can track the progress of your accounts 24*7. There is no hide and seek. OVLG has a budget-friendly fee structure. Anyone who is in deep financial trouble can easily afford the fees. Please note that we don’t charge any upfront fees. Our client survey results say that almost 84% of our clients are satisfied with the quality of our services and the time taken to resolve their different types of queries. No matter what is your problem, we are there to solve it. Yes, we have 12 different solutions for different kinds of financial problems. And that’s why we call OVLG - the best one stop shop for legal solutions. You can can compare and then pick the best solution anytime. Yes, we have finally reached 48 states in the country. Unless, you stay in Wisconsin, Vermont, Colorado or Connecticut, we’ll be happy to solve your legal and financial problems 24*7. A trustworthy law firm is incomplete without an attorney hub. OVLG is proud to announce that it has a panel of experienced and competent attorneys. They’re ready to reduce your debts, save money and give legal advice in 48 states. Online tools help you get the correct roadmap to financial freedom. OVLG offers debt help calculators and letters to negotiate with creditors absolutely free. You can get a pdf version of the letters, take a print out and mail it to creditors.